This is the page where we are engaged in writing the glorious and humorous history of the Hamilton Mountain BIke Club. We are working towards creating a complete record of our club from the very beginnings. 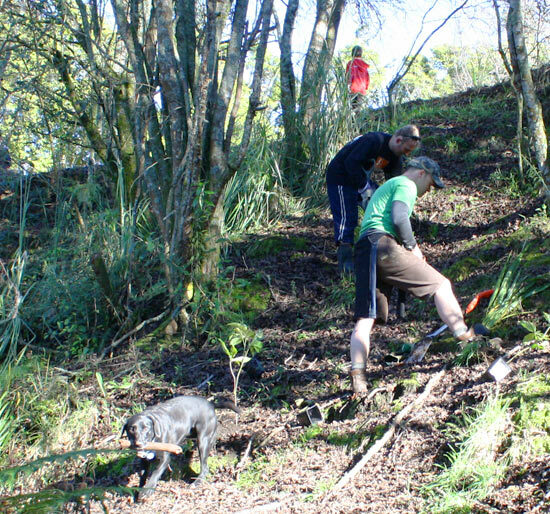 For this we need YOU, our members, especially those who have been around for a while, to get out your old photo albums and sift through the memory banks for memories of those early days approaching the council, clearing the very first trails at Pukete etc. We want every one of those early club “pioneers” to receive their due recognition for the job they did in creating this amazing club and park. WHY? Because other people around the country may benefit from our experiences and then they can do the same things in their town as we have done in ours. Soon there will be Pukete’s springing up everywhere for us to go and ride in as we pass through those towns. Everyone wins! History of the Hamilton Mountain Bike Club. The research for this history is being undertaken by consulting with club members of yesteryear, some of whom are still current members and by combing through the minutes of old committee meetings and AGMs. It is a work in progress and will be added to and modified if necessary as further information is uncovered or brought to our notice. Please contact us if you find errors or if you can add information. In the year 1999 the riders were just beginning the task of creating the park we know today. Ian Tooke, Peter Taylor, James Gurney. Photo provided by Alan Hurford. 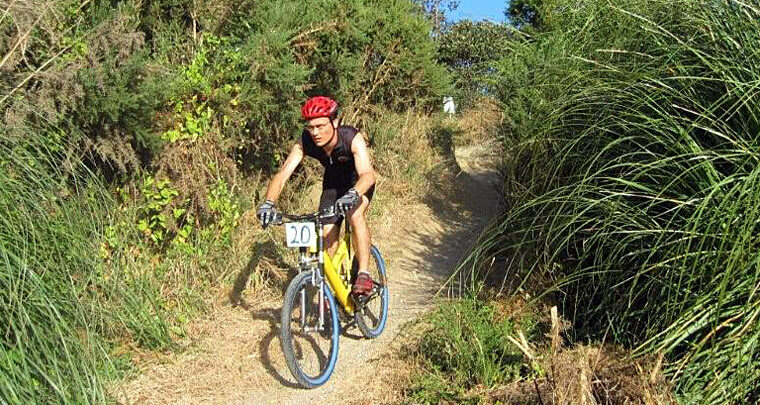 The first mountain bikes to enter the country came in the year 1984. The following year much larger numbers began arriving in NZ. By the late nineties, most bikes being sold in New- Zealand were mountain bikes, and this is still true today now, as I write in the year 2008. This then indicates that when Hamilton Mountain Bike Cub came into existence in 1989 the sport of Mountain-biking was still very young. The club was founded in that year by Dave Judson and Geoff Short with Dave Judson becoming the first president. Geoff Short was then the owner of the Cycle and Mower Warehouse. In those days the members mainly rode the Ngaruawahia forest tracks where the club was very active holding many races including national level events. After Dave Judson (1989 to 1995), the next president was Larry Spicer (1995 To 96), followed by Kevin Lindsay (1996 to 1998), James Gurney (1998 To 2000), Ross Cochran (2000 to 2007) and Tui Allen (2007 to . . . ). There was a “Walking Stick Award” in existence in the club as early as 1994 where we found a record of it being presented to John Otto for getting lost at Turangi , and taking three different dead end tracks in an attempt to find his way out of the bush. A later set of minutes recorded that “John (Otto) was to organise a 3 day trip to nowhere”. The legendary death marches of John Otto have remained in the collective memory of the club and are often still spoken of with reverence by current club members. 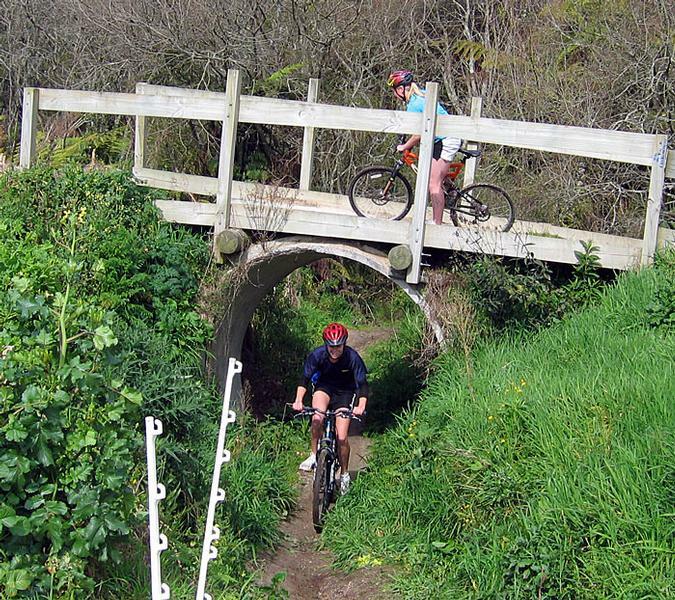 The Ngaruawahia tracks closed to mountain bikers in the mid nineties (date required) leaving the club with no suitable venue for events and recreational riding. Riders travelled out of Hamilton for club rides and were forced into unofficial explorations of any available land – possibly sometimes even illegally, but having no suitable area for organising regular races. The beginnings of Pukete Farm Park being considered as a venue for club activities may have happened during Kevin Lindsay’s term as club president. There is a record in the club minutes of a meeting on December 20th 1994 where the club was offered the use of some industrial land at the end of the Te Rapa Straight. (Could this have been Pukete area we use today) Present at that meeting were Kevin Lindsay, Karen Hastie, Larry Spicer and John Billingham. It is possible that at the time this was not considered deeply by the committee as the Ngaruawahia tracks may still have been in use then. Other venues came under consideration after the Ngaruawahia tracks closed – like Seddon Block, Horohoro and Minogue Park. James Gurney remembers Murray Healey approaching council to use Minogue Park for races. He was supported in this by Ben Bunning, a mountain-biker who also was a recreational planner for Hamilton Council at the time. This is an early example of good club collaboration with the Hamilton City Council which has continued to this day. In 1995 a club constitution was adopted. The AGM of May 98 records discussion of the need to find a local race venue with “most riders wanting a fun local ride.” The AGM of 1999 has a letter to HCC thanking them for the use of Minogue Park. There is also a record of James Gurney briefly discussing Pukete Farm Park signs. 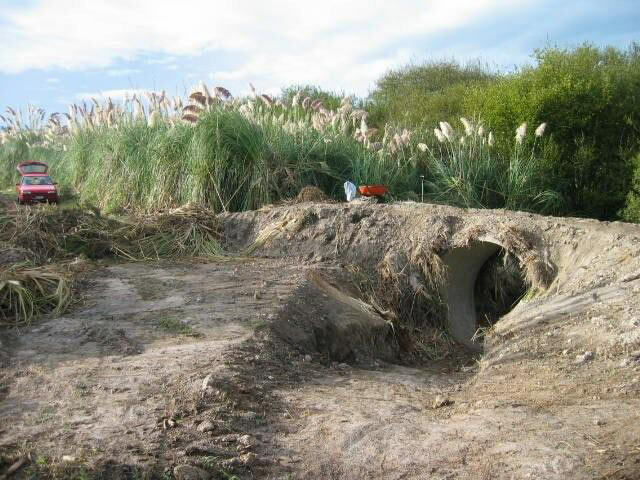 This was the first mention found of Pukete Farm Park in name in club records There is an earlier mention of committee surveying a bike park to assess a work program there in March 1999. It seems likely that this was Pukete Farm Park and ties in with James Gurney’s memory of the work having started on the park in April of that year. James Gurney remembers going with Peter Taylor and Ross Healey to a meeting with Bill Featherstone and Janet Sexton in council regarding the use of Pukete for club events and track building. 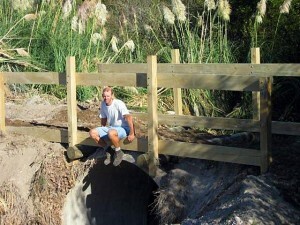 They were told there that they could apply for a license to use the park for MTB. They applied and were granted the license and the work started, in April of 1999. Gurney also describes an early reconnaissance visit to Pukete as follows: ”It was covered with 8ft high gorse, blackberry and cutty grass. There were none of the existing tracks – just a few rutted motor bike tracks and there were 20 odd old wrecked car bodies lying around in what was nothing more than an area of weed-choked wasteland which might be described as a mixture of dump, sandpit, and swamp. 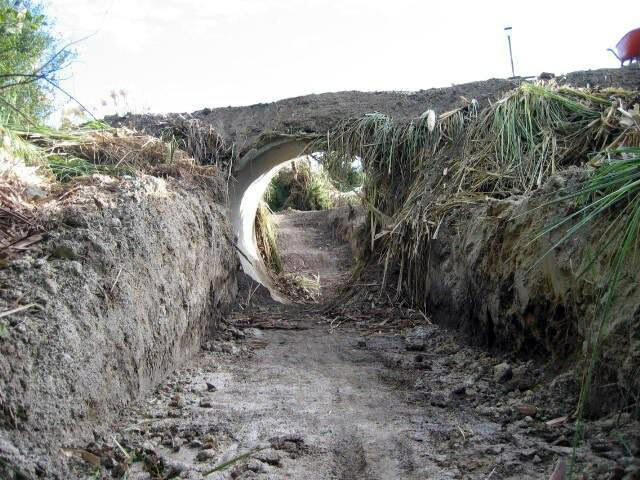 We took a look at it and immediately realised it was going to be too hard.” Clearly it was a project too big to be undertaken by volunteers. However, since there were no easier choices on offer, work began anyway. Council agreed to remove the deceased vehicles cluttering the area. Huge amounts of other rubbish were removed by the mountainbikers. They worked on the track all that winter after the April start, eating lots of pancakes in the process. The work was mostly carried out in weekends or in the evenings after work, – not a lot of riding got done that winter, the riders were all so enthusiastic about getting the new tracks built and usable. They counted up each new metre of track as it was created, gradually increasing the total distance metre by metre, noting between themselves, the number of new metres added after each work session. Helpers at this stage were James Gurney, Ross Cochran, Paul Andrew, Peter Taylor, Karl “Sooty” Bain (now Karl Keys), Kevin Lindsay, Ross Healey, Alan Hurford, Norm Doidge, Norm’s son Haisley and Vaughan Wallace. The club owes a debt of gratitude to these early track-building pioneers without whose massive volunteer efforts the track we know and love would not exist today. The longer more sweeping trails in the centre of the “sandpit” area were created first. Later, Ross Cochran vividly recalls James Gurney literally rolling up the weed-choked earth in huge rolls to create what has ever since been known as “The Gurney Trail”. That is the very wiggly section of trail we ride as soon as we enter the inner track. James remembers making cuts down into the ground several inches deep on either side of where he wanted the trail to be, and this made it possible to roll away the earth in between the cuts, removing weeds and topsoil in one long sheet. They spent a lot of time also chasing away the illegal motorbikes whose destructive activities threatened the new tracks before they were ever put into good use by the MTBers – the beginning of an on-going battle we still fight to this day to keep the track-wrecking motorbikes away. As shown in the photos below, parts of the track were once used in the opposite direction from how they go today. 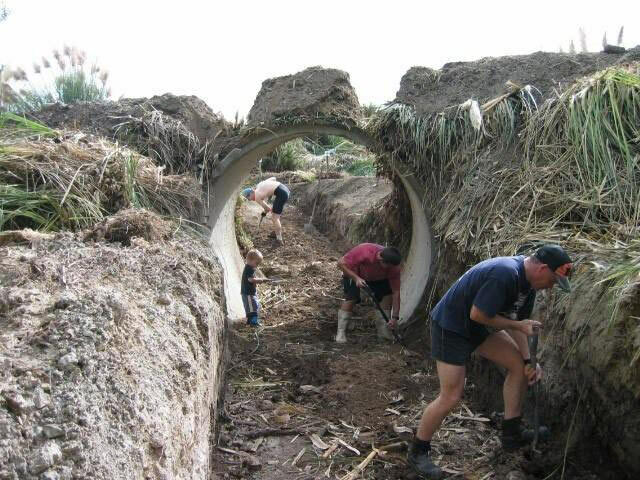 The pipe went in 7th April 2003 and the bridge was installed a few days later on 12th April 2003. In the last photo below the bridge/tunnel is performing its collision-avoiding function. In mid 2003, there are club records of Liz Andrew finalising a new constitution with lawyers prior to the club becoming incorporated. The AGM of August 2004 was recorded as being the first as an incorporated club. 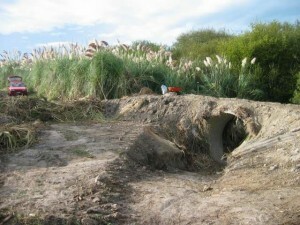 2005 saw the launching of the club web site, something which alerted the world to the existence of good mountain-bike tracks at Pukete Farm Park in Hamilton. Within a few short months of its launch, Alan Hurford was able to inform committee meetings of how many hits the club had been receiving from each overseas country and after a while, sure enough members began to run into people with overseas accents using the track after having seen it on the web from some distant land and deciding to pay a visit to Hamilton so they could use the track during their holiday in New-Zealand. Huge loads of rubbish were still being removed from Pukete Farm Park by the mountainbikers as recently as October 2005 when this photo was taken. The picture below shows the amount that was removed this same day in this one session alone. About this time and over the next year or two, several factors combined to produce a noticeable steady build-up in the numbers of people attending the Pukete races and the membership of the club itself. 1. 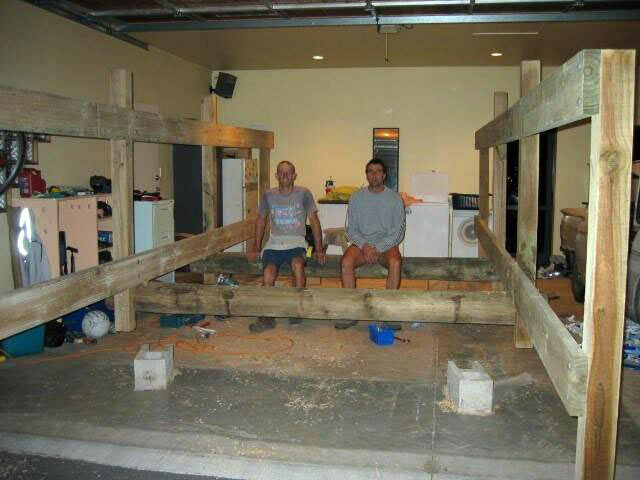 Articles appearing in local papers featuring club president Ross Cochran describing the club’s involvement in Pukete activities, races and promotions, which raised the profile of the club. 2. The added public exposure gained via the web site, such exposure having the advantage of being not only nationally available but internationally. 3. Fuel price increases encouraging people to take up cycling. 5. 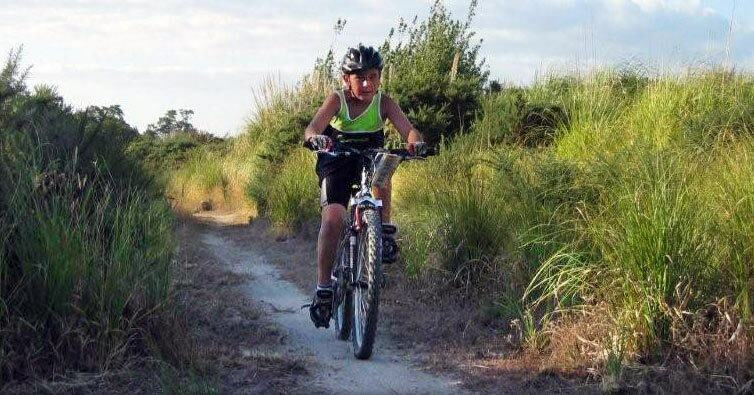 Safety concerns regarding riding on roads, increasing the appeal of mountain-biking as a family sport in comparison to other forms of cycling which involved greater exposure to the dangers of traffic. The summer race series at Pukete Farm Park has, since the year 2000 ?? ?, consisted of 6 Wednesday evening races in the weeks leading up to Christmas, a break from racing for a few weeks over Christmas, then another set of six Wednesday evening races after Christmas. These races have been mostly directed by Ross Cochran with consistent and capable back-up from his wife Heather working at race registration and timing, often involving the co-ordination of other volunteers to help carry out these complex tasks. Each race is traditionally followed up by an informal prize-giving where race sponsor’s products are given out as spot prizes to lucky recipients whose race numbers have been drawn. CycleTime bike shop has been the major sponsor of the summer series since the year ??? During 2007 an old club tradition of awarding the “Walking Stick of Doom” to the person who had suffered the worst misfortune of the race was re-introduced by Ross Cochran. The first night race series was held in the year ???? and it has become a tradition to hold four night races during the month of April. There was an attempt in the year 2006 to hold these races once per month over the whole winter instead of once a week in April. It was not a success with participation well down. Since then the April format was re-instated. In Ross Cochran’s 2007 president’s report at the end of his 7 year term of president , he reflected that he had seen the club develop from being a much-needed provider of direction and supervision for people who wanted to go riding, to its current role of Pukete Farm Park management. Ongoing track maintenance and development of better drainage systems had by this time rendered the track usable year round and it was now possible to go to the track at almost any time of the day, any day of the week, any time of year and find it in full and active use by many representatives of “Joe Public” on wheels. Riders were by now even doing night ride training there during the hours of darkness. In weekends the track is a constant bustle of activity, mainly for riders but also includes walkers (some with dogs), and runners. A survey by Russell Stark recorded hundreds of people entering and exiting the MTB tracks over just a few hours one sunny Saturday. A once-per-month Sunday afternoon winter series was proposed and instigated by Russell Stark in the year 2007. This race series was designed to encourage family and child participation, with the early afternoon weekend timing being easier for young families. The more traditional serious-racers were also encouraged to still be a part of this series and the result was a mix of serious and beginner riders sharing the tracks on race days. It was very successful in bringing in some new young families to the club and also had the effect of maintaining public interest in the trails over winter. On Tuesday 4th September 2007 a very successful “Get-to-Go” mountain-biking day for year 9 and 10 schoolchildren was held in the Park. Hundreds of teenagers came from all over the Waikato to compete in this event which involved bike racing on the tracks and bike maintenance skills contests. 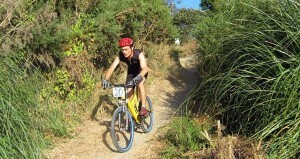 In 2007 a club online forum was launched within the club web site as a medium for club members to freely confer online to arrange club rides, expeditions, working bees, to hold pre and post race discussions, and conduct discussions about club directions, Pukete track concerns or the sport in general. This gave the entire club a free and public voice. It has proved a popular and effective communication tool. The 2007/2008 Pukete summer race season saw record numbers in race participation occurring week after week, especially in the post-Christmas series. 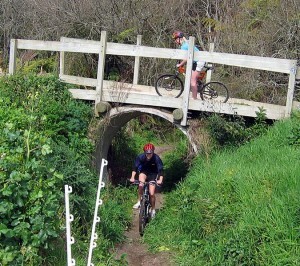 In the first few years of club racing at Pukete, about 40 was a fairly normal turnout of riders. By February 2008 it was common to get close to 150 riders turning up to a race. With their supporters, their vehicles, and all the race spectators, Pukete Farm Park started becoming the “In place to be” in Northern Hamilton on Wednesday evenings and family picnics have become a common sight at the park on these nights. Unlike many other sports venues, alcohol has never been part of the scene and this is largely due to the efforts of Ross Cochran in barring its use in the park and regularly reminding mountain-bikers of the need for keeping the park alcohol free. The club derives satisfaction from seeing the ever-increasing public use of the tracks, at all times, for off-road cycling with people now coming in to use them from all over the region, from far beyond the region and even sometimes from distant parts of the world. Also most satisfying to note has been the increased numbers who join up to the club in full family groups and then compete with Mum, Dad and the kids all riding in the same race. This family participation has been much encouraged throughout club history as is indicated by our very “family friendly” fee structure. Ongoing efforts by committed club track volunteers see the tracks gradually increasing in length and quality with every passing month. 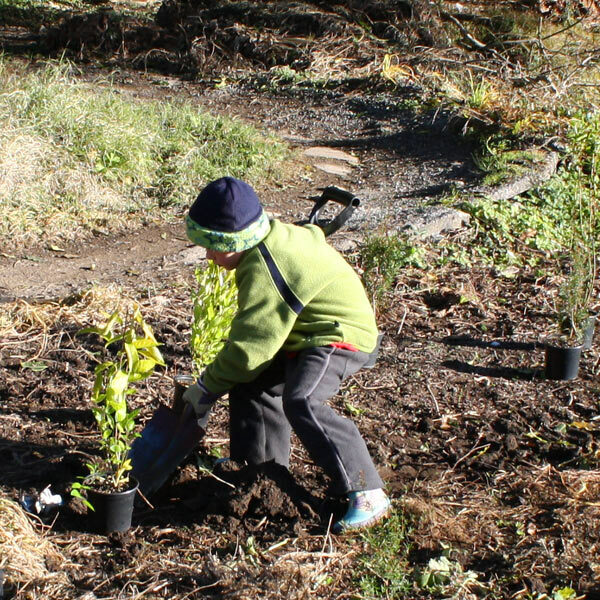 There have also been tree-planting sessions and weed control efforts by club and council over the years since 1999 to improve the park environment. All this helps the slow but sure conversion of what was once a dreary and deserted wasteland into a unique fantasy wilderness laced with inviting networks of magically twisting trails to utterly capture the imagination of the ever-increasing off-road cycling public. 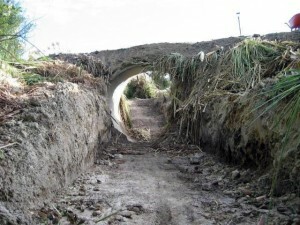 In early 2008 the club was approached by Keely B Kalirai, Policy and Structure Planner of Community Assets in the Parks and Reserves Unit of Waikato District Council to consult with them over the possibility of converting land in the Wainui Reserve in Raglan to use by mountain-bikers. Following this approach, club representatives and track designers, including, Russell Stark, Tui Allen, Jeff Tucker, James Gurney, and Chris Moody made a very positive assessment of the land in question and then worked on track planning for the area. Those plans have subsequently been submitted to the council, for use in their consent processes. In January 2008, the club produced its own club cycle-shirt designed to give members a special visual club identity to make it easier to spot one another at events and also to enable us to be clearly distinguishable from other clubs and ordinary riders. These have proved immensely popular with over fifty sold in the first few weeks of their becoming available. They are bright lime green with emerald green side panels and decorated with Pukete like vegetation in a filigree effect. Our evil gossipmongering club mascot Patrick the Pukete Possum is featured front and back. In the photo to the left, taken on the 30th January 2008, Paul Andrew leads Ross Cochran and Dave Blanchett towards the Gurney trail, all three wearing the newly available club shirts. The club membership in 2008 passed the 200 mark and in the last race of the summer series the numbers of riders in a single race reached 150 for the first time. This was after a summer series during which the numbers increased steadily race by race. The Groundeffect “Slush Fund” has provided money that has paid for most of the cost of the new trailer we use to get around the park to build and maintain our trails at Pukete. Groundeffect makes superb MTB clothing so grab yourself some. The club now has an arrangement with the council that we plant trees in the park every winter in lieu of license fees. License fees would otherwise come to thousands of dollars which would mean a considerable hike in our annual subscriptions. The council even provides the trees free of charge! 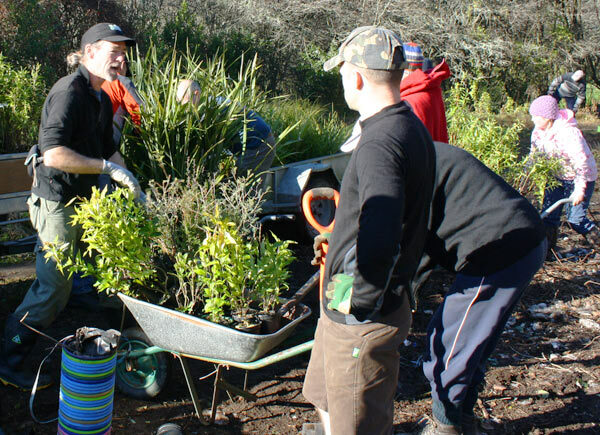 So whenever you hear of a tree-planting working bee, it is the responsibility of everyone who appreciates the park to get down there and help us. 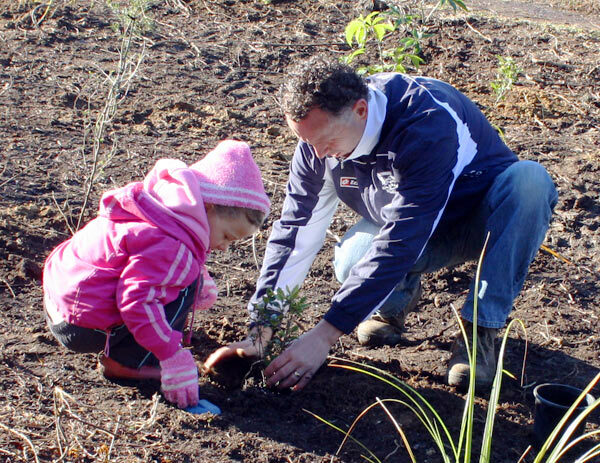 Then when our kids grow up, the park will have changed from the weed-patch it tends to be today into a beautiful native forest alive with the singing of native birds. The process is under way already – lets keep it going strong. 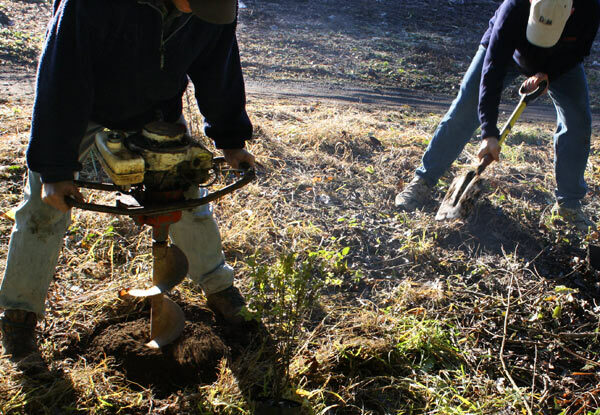 We need to plant hundreds of trees – its not just one or two, so many spade-toting helpers are always needed for this big job. Tree-Planting Working Bee of 21st June 2009 – True “People Power”. The best turn-out ever for a working bee at the Pukete tracks. 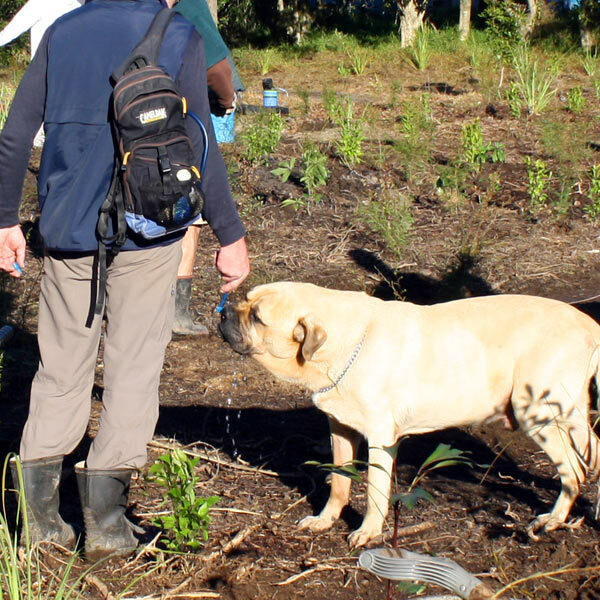 In spite of a frosty morning and an early start, over 40 people turned out to plant 1300 trees, mostly in the area on or near the Gurney trail, and the area surrounding the new tracks, including some wetland planting just below them. We were supervised by Patrick the possum who gratefully watched us from a nearby tree, as we made excellent provision for his future food supply. (see photo) Lefty the legendary Pukete-kitty also visited but showed far more interest in the swap-meet afterwards than in the tree-planting itself. Gerard Kelly from the council brought all the trees along and gave us information on how and where best to plant them. 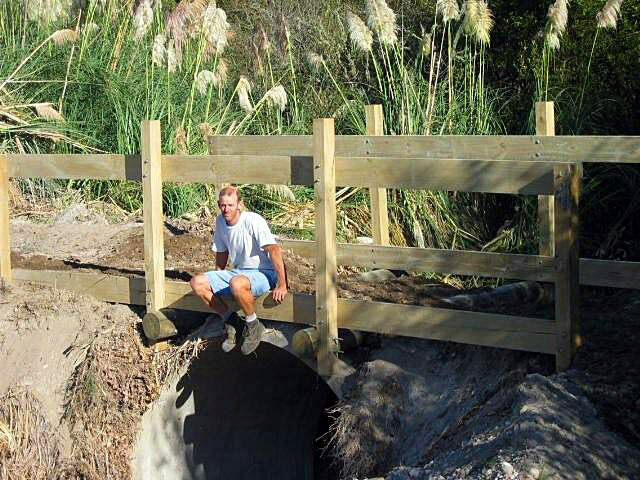 The work was also carried out under the supervison of Doug Hope and Dave Hudson, who made sure we didn’t plant in such a way we would make future trail maintenance difficult. We had families, including young children on the job and we had a good sprinkling of our young rising star competitive male riders whose strength and fitness came in as handy for planting as it does for winning races. Names of these included Jack Chapman, Josh Parkin and Connor Dove. The entire committee was also there. 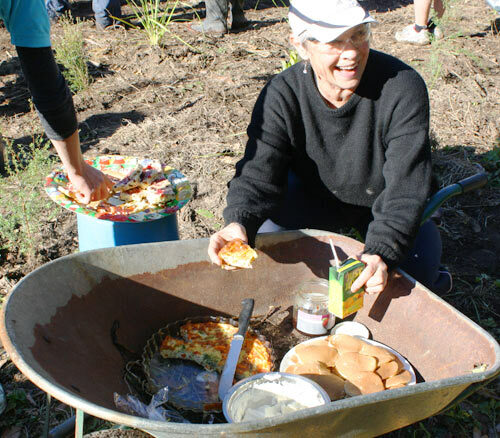 Because of the large turnout, planting was finished well before mid-day, and once the work was over, much food was consumed, some of which was served from muddy wheelbarrows, which made excellent dining tables. Thanks to those kind people who provided such excellent food for the workers. Maria Cleland’s quiche was delicious. So were Isy’s pikelets. Money changed hands at the swap meet afterwards.